Sony’s final exclusive for the original PlayStation, developed by Quake II porters Hammerhead and improbably starring a garishly-dressed court jester, Jinx should have landed a footnote in gaming history on its idiosyncrasies alone. 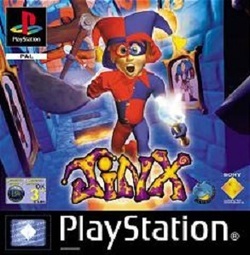 During a generation initially dominated by the 3D Platformer, Jinx’s release, seven years on from the launch of the format in Europe, already had the air of a gaming love letter – not to a departing console, but to a genre unflinchingly knocked from its perch by an emerging onslaught of sixth-generation shoot ‘em ups and open-world games. Hammerhead’s involvement in PlayStation versions of Shadow Master and Quake II hint at something a rather more grizzly than the bright, breezy and colourful palettes you’re treated to, but Jinx is a 3D platformer that’s got a few tricks up its sleeve, and is about as far removed from the developer’s past work as you could imagine. It’s centred around the simple tale of a King, Queen and their court being put under a spell and kidnapped by pirates, leaving only the court jester Jinx (who bares more than a passing resemblance to the nutty Fargus from Pandemonium!) to battle for their safe return. His journey spans six worlds that consist of three levels each, and though the concept’s not remotely original, Jinx’s design is vastly underrated, with distinctive, varied environs that offer a nice variety of challenges and plenty of platforming. Play for a few minutes and it seems lightweight, but Jinx’s merits soon reveal themselves. "Those boxes look like they need pushing into those erm, graves?" Mamoo City is where things kick off. Very clearly derivative of earlier fifth-gen 3D platformers, this grass ‘n’ castle walls opener nevertheless makes for comfortable entry point, thankfully avoiding any formulaic training routines. 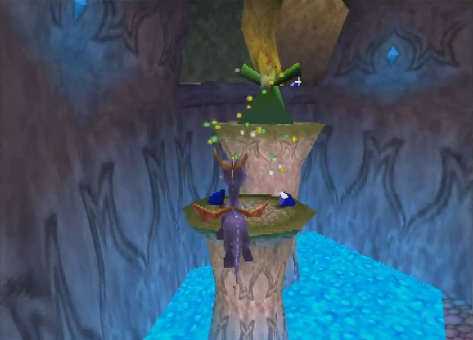 By the time you reach Pyramidicia and Aquaquatica (desert and water worlds respectively), the game really starts to stretch its legs, with a mixture of block-pushing, switch-flicking, ledge-leaping and swimming abilities blending together smartly, with Jinx pulling off the whole “kids Tomb Raider” thing better than anything since Croc. The spooky Schloss’ Kreep challenges you to plan ahead as doors have to be opened in sequence, and it even tries its hand at the odd puzzle, including classic dash-to-the-closing-door trope and some neat floor puzzles. It’s also refreshing to see an emphasis on true platforming elements; Jinx seems to have drawn inspiration from the right places and makes for an engaging adventure that’s commendably balanced. It may look cute, but Jinx keeps the player on their toes. Some genuinely tough sections carry added pressure as you can only hold a maximum of nine lives, and attaining one hundred stars for an extra life, particularly in the early stages, is no small feat. Jinx doesn’t hand you anything on a plate, and you’ll quickly find that carelessness leads to trouble. Heart-in-mouth moments emerge from familiar genre staples such as perilous jumps, retracting ledges, spike-pads and lava pits. Some bits are just a little too precarious for comfort however, due to some iffy manoeuvring. On the flat, Jinx moves okay, though judging some of the more marginal jumps can frustrate as the jester has a tendency to slip off ledges if you get to close to the edge. Nevertheless, the motivation to see what the game has in store for you next remains, and that’s a compliment for any platformer. The jester has a range of items at his disposal, ranging from cherry bombs and anvils for dispatching individual foes, to devastating tornados that wipe out several in one go. Best of the lot though is the egg-timer which is a supremely useful tool as it slows time; not only do the enemies move slower, but the platform mechanisms as well, allowing you to negate the hazards of retracting ledges and descending ceilings. They paper-over the fact that Jinx’s combat leaves a lot to be desired. His staff is piteously short-ranged and highlights some particularly unflattering collision detection troubles, and if it wasn’t for the bounce attack making life a little easier, the fighting system could have been a real problem. Jinx wasn't taught to read! He was taught to be a fool! Literally. Jinx pays extensive homage to Spyro’s plump, colourful art style, and whilst it’s a little anaemic-looking by comparison, you could do worse than use Insomniac’s gorgeous adventures as a blueprint. Environments are bright, detailed and chunky, though the 360 degree camera has a mind of its own at times (making some jumps more troublesome than they should be). The surroundings themselves are simple but pleasant; replete with large statues, tombs, waterfalls and castle exteriors, complimented by little touches such as flitting butterflies and explosions of colour that lend it an appropriate air of cartoon fantasy. The music is unexpected bonus; catchy and well-composed, the subtle stylistic changes that come about with each new area (a little spookier for the Schloss’ Kreep levels for instance) are effective and, in each instance, fit the action to a tee. However, there are areas where Jinx’s presentation comes up short. NPC animation is really quite crude, with basic, disproportionate features that look like a child’s drawings, whilst the enemy designs aren’t much better. Replay value is bolstered as every level holds its own secondary challenge. The game is filled with light-hearted individuals who’ll raise a smile, notably Lara Croft wannabe Chambermaid Jordan and Captain Gaybeard. These figures will task you with retrieving items as far-removed as lost treasure, roses, pumpkins and oxygen tanks. These add fresh impetus to Jinx’s adventure, with some errands unusually spanning several different worlds. The rewards are useful too; Truth Gems open up a trio of simple but enjoyable bonus stages whilst acquiring all of the crown jewel pieces is a necessity to fully completing the game. A 2003 PSone release ensured the production values were never likely to worry the Crash’s and Spyro’s of this world, but it’s easy to ponder what might have been had Hammerhead had a slightly punchier game engine at their disposal. That said, the lack of bells and whistles only makes this enjoyable, well-rounded platforming underdog more endearing – just don’t expect anything wildly original.